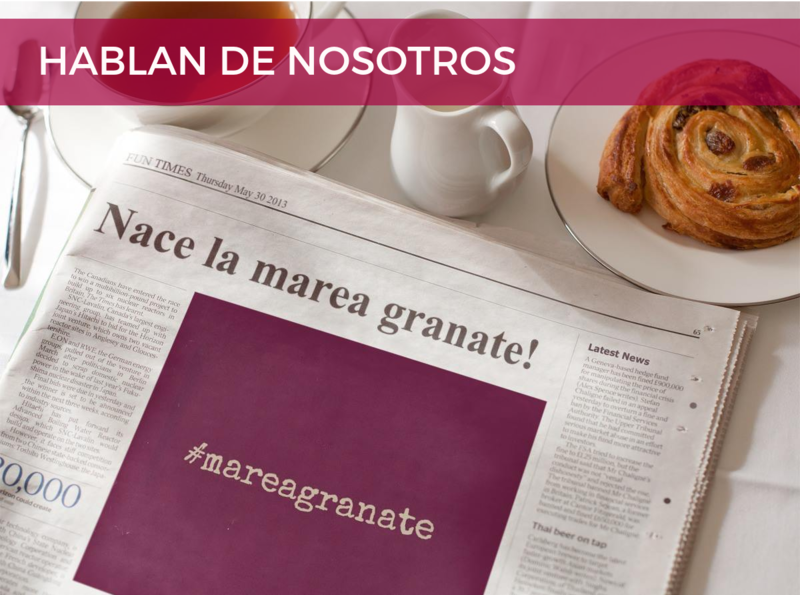 Marea Granate (Maroon Wave) is a transnational non-partisan organisation formed by emigrants from the Spanish State and supporters, which aims to combat the causes of the social and economic crisis that have forced us to emigrate. Our collective was born in the light of other recent social movements in Spain over the last years. We are somehow the extension of them abroad. Our wave is maroon like the color of our passports, the symbol of our forced migration. Our current situation as immigrants is the result of both the implementation of severe economic policies and the increase of the social injustice in Spain. Corruption, encouraged by an unscrupulous system, both nationally and globally, stole our space as well as our nonexistent democracy, our voice. A minority sick of greed, makes the decisions that belong to us in their own and exclusive benefit. We denounce the current role of the Troika (EU, ECB and IMF) as well as the begged vote*. We analyze and denounce the destructive consequences of the current economic system: on one hand, by identifying the causes that have led us to abandon our hometowns, our families and our friends; on the other, by highlighting the hard living conditions that immigrants face. We are aware that ours is not an isolated struggle, that the causes which have led us to stay out of Spain are not unaware in other countries; so that we are looking to establish deep ties with local groups around us. Moreover, there are other groups of immigrants in our host countries with whom we collaborate creating a mutual support network for the new arrivals. Maroon Wave crystallizes a shared feeling to change things. We are an horizontal movement of people that gathers regularly both locally and globally, either in public assemblies or virtual meetings. We boost new ways of political participation, self-organization and the defense of rights beyond the borders. For this purpose, we are building up a network of international cooperation, while joining other initiatives aiming a fair and free of precariousness future. Our actions are characterized for being non-violent, based on the ideas of mutual respect, self-organization, solidarity and the common good . How can I take part in Maroon Wave ? We assume that everyone has a lot to contribute. If you have had to migrate, do not hesitate join your local Maroon Wave group. If there is none, we encourage you to create one. If you are in Spain , we kindly invite you to give visibility to our movement. * Spanish nationals living abroad must send a formal application to express their intention to vote before the elections. It is considered as a new way of census suffrage. Unia-Schweiz: Gewerkschaft als größte MigrantInnenorganisation - Sí se puede! Eine Gewerkschaft als größte MigrantInnenorganisation der Schweiz? - Sí se puede! I’m very interested in the work of Marea Granate. I’m a university professor in the United States and I’m conducting research on social movement activity in Spain. I’d like to learn more about Marea Granate. Would someone exchange messages and help me understand the history and current work of the collective? Please excuse us for the delay on answering you. We have just seen this comment. Please contact us through coordinacion@mareagranate.org with the specific questions for your research and we’ll be pleased to answer.